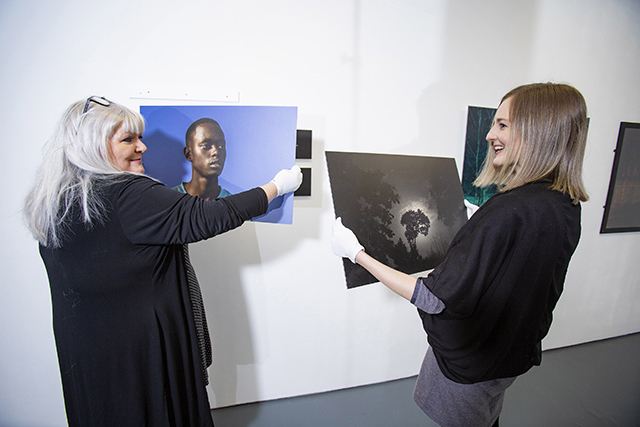 Image: Pictured launching the exhibition is Deirdre Robb, Chief Executive, Belfast Exposed with Joanna Johnston, Arts Council of Northern Ireland. A special exhibition at Belfast Exposed featuring selected photographic works from the Arts Council of Northern Ireland’s contemporary art collection is now open. The exhibition has come about as part of the Arts Council’s new Art Lending Scheme, a free scheme which is open to curators, galleries, and organisations interested in putting works from the Collection on public display. Inspired by the wealth of photographic works in the collection the curators wanted to ensure the photography works on show were reflective of the breadth, diversity and talent that Northern Ireland excels in. There promises to be something for everyone, including a range of emerging and established artists dealing with topics such as life and death, domesticity and feminism, war and colonialism, as well as urban scenes and landscapes. The exhibition features 21 artists including renowned photographers Paul Seawright, Donovan Wylie, Susan MacWilliam, Peter Richards, Ailbhe Greaney, Fergus Jordan, Laura McDowell, and Joanna Karolini. It also includes 3 video works from Mairead McClean, Adrian O’Connell and Angela Halliday.